With another year in the books, an analysis of world stock markets tells something most of us probably wouldn't have guessed by just looking at our portfolios- it was a very good year. Of the 95 international markets we analyzed, only eight finished in the red, while the average return for all 95 was 37.4%. That's right 37.4%! 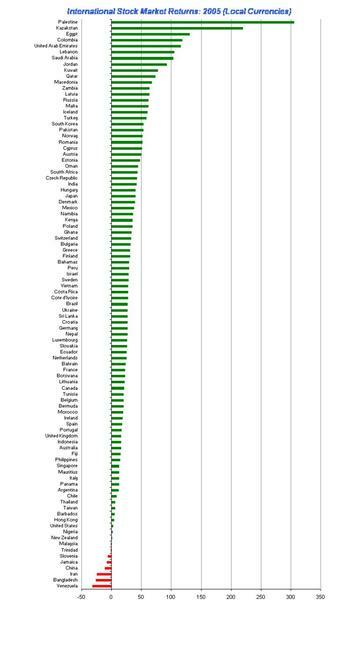 The US finished up a modest 3%, while politically unstable regions of the world had banner years (Pakistan up 305%, Kazakstan up 220%, Egypt up 131%, and Columbia up 118%). Even the Lebanese market doubled for the year. Interestingly, China which is supposed to be the hottest investment in the world, was down 11.01%. That trailed even Jamaica's 7% decline (no worries mon!). Will the US market's improvement catch up with the rest of the world next year, or will the bleeding of capital out of our country continue. Only time will tell, so good luck in the year ahead. The market ended the year on a sour note today. While trading was quiet, there was a clear trend of selling winners as buying the winners at any point throughout the day underperformed buying the losers by a wide margin. Another quiet day today except for a late afternoon sell off which while relatively large in the context of the last week, was pretty insignificant when you put it in perspective. With another slow day, there was also very little in the way of intraday rotation. We've all heard the term, "A watched pot never boils.” and certainly as this year proves, when the crowd is looking for something to happen, it usually doesn't occur. With the recent inversion of the yield curve, we did a word search of The Wall Street Journal for the term "yield curve". As we suspected, during this period, the yield curve (and the potential implications of an inversion) has received more than its usual share of attention. Year to date, the term has shown up in the Journal 146 times which represents a 68% increase over the peak reading in 1993. 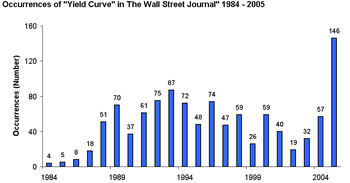 In 1999 and 2000, the last time the curve inverted, there were only 26 and 59 occurrences, respectively. The Best of the Web? 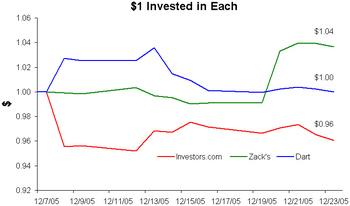 On December 1st, we posted a list of stocks that show up as buys the most on 7 different investing websites. 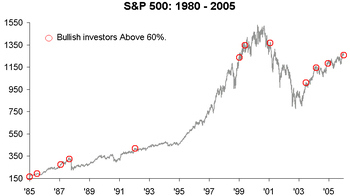 Those eight stocks had a return for the month of 6.73% versus the S&P 500's return of 0.81%. This month there were only four stocks that showed up as buys on four different sites. Below is a list of stocks that showed up on at least 3 different sites with the ones that showed up on 4 highlighted in yellow. The latest Investors Intelligence data released yesterday indicates over 60% of those polled fall into the bullish camp. 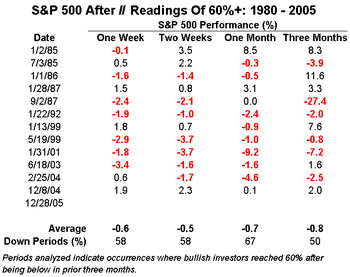 Many consider this 60% threshold a contrary indicator, so we looked back at prior periods where bullish investors reached this level and found that indeed the S&P 500 has negative average returns (albeit modest) in the following week, two weeks, one month, and three months. Of the 12 periods analyzed, there were only two where the market traded up over each of these four intervals, the most recent being December of 2004. This data suggests that investors may be best off not only drinking in moderation leading up to the new year, but also buying stocks in moderation. The market may not have been up much, but it sure beats yesterday. As volume was light, there was very little in the way of intraday action to speak of. Now stop reading this and enjoy the holiday week. I know that's what I'm about to do. 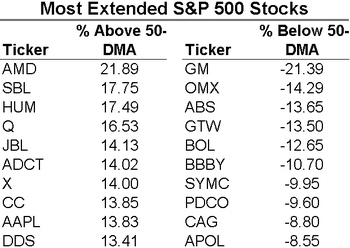 Below we highlight the ten most extended S&P 500 stocks above and below their 50-day moving averages. 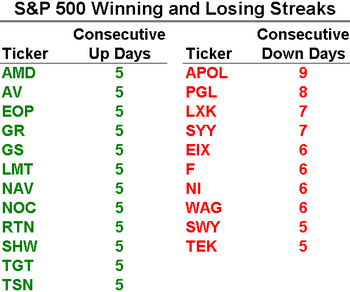 We also highlight S&P 500 stocks that have been up or down at least 5 consecutive days.